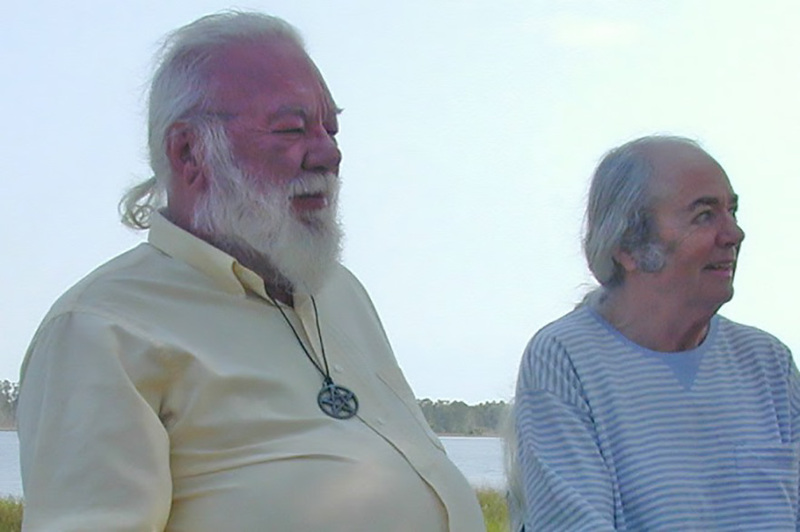 The Founders of Wicca in the U.S.
A Scorpio. After earning his doctorate in physics and mathematics from London University, Gavin entered the aerospace industry. It finally took him to Southern California, where he and Yvonne met in 1966. Yvonne was a member of Mensa, the high IQ society, and a graduate of Fullerton JC. When a shared interest in the occult and in alternative spiritual paths brought them together, they moved to St. Louis, MO., where they founded the Church and School of Wicca in 1968. At that time they started an occult correspondence school teaching Witchcraft as a spiritual path, along with astral travel, sorcery, astrology, and psychic healing through the mails, to a worldwide student body. The Church earned its religious tax-exempt status in 1972. With the publication of The Witch’s Bible and later The Magic Power of Witchcraft, the student body grew. The Frosts taught thousands of students the fundamentals of their spiritual philosophy. Eventually the Church developed branch covens and churches across the United States. The actions of some of those covens led to a rigorous IRS investigation of the Church and the Frosts. The Frosts successfully proved that the Church was indeed a valid one. A further consequence of the investigations was a prisoner case and the federal appeals court ruling which again validated the Church and School (Dettmer v. Landon as referred to elsewhere on the site). Although officially the Frosts are semi-retired, they continue to write books and to lecture at various pagan gatherings around the nation. Each year at Hallowe’en they can guarantee dozens of radio interviews and several TV appearances. This furthers the general population’s interest in Wicca and de-demonizes it.